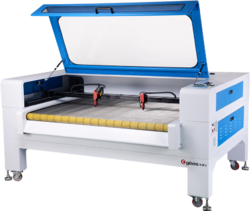 Providing you the best range of garment label laser cutting machine and textile label laser cutting machine with effective & timely delivery. The domestic first double layers automatic feeding function, with two intellegent interactive laser heads, Over 4 times working efficiency improved comparing with single head lessed cutting machine, higher production. Lower energy consumption and less labor.